Ulysses Simpson Grant (1822-1885) was a great American commander who achieved fame as the leading Union general of the U.S. Civil War. He became the eighteenth president of the United States, and served two terms. During his administration, he suffered greatly from corruption cases involving members of his government, and received both high praise and censure. 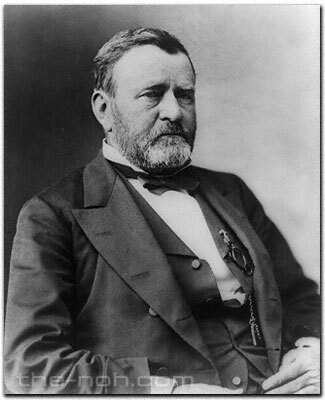 Historians now rank him among the worst U.S. presidents, but he is popularly remembered as "General Grant" because of his contributions in the Civil War. General Grant is said to have had no little influence on the history of Noh. After resigning as president in 1877 (Meiji 10), General Grant left his hometown of Philadelphia to travel the world with his wife. He visited Europe, Egypt, India, Singapore, and China, and after two years, he arrived in Japan in June 1879 (Meiji 12). He met the Meiji Emperor several times before leaving at the end of August. Received as something of a goodwill envoy or adviser on international politics, he enjoyed meetings with members of the Imperial family other than the Emperor and with leading government figures. Lord Iwakura Tomomi, the then Minister of the Right and a patron of Noh, was among those who met the General. On July 8, Lord Iwakura invited Mr. and Mrs. Grant and some of the Imperial family to his residence, treated them to Japanese and Western dishes, and entertained them with Noh performances. These included the short Noh piece "Mochizuki" by Hōshō Kurō, the Kyōgen piece "Tsurigitsune" by Miyake Shōichi, and the Noh piece "Tsuchigumo" by Kongō Taiichirō. They also watched some Noh dance pieces, including "Hanagatami" by Kanze Kiyotaka, "Shun'ei" by Umewaka Minoru, "Kurama Tengu" by Umewaka Rokurō, and "Shōjō" by Umewaka Manzaburō. It proved to be a highly successful event, not only because the performers were all great masters of the age, but also because the Grants were provided with brochures with English synopses of the Noh and Kyōgen pieces. "Mochizuki" is a revenge play in the category of Genzai Noh (stories set only in the present), and has many attractive dance scenes including ones with a lion's mask. "Tsurigitsune" is one of the most accessible Kyōgen pieces, while "Tsuchigumo" is one of the specialities of the Kongō school and features the stage effect of spider threads. The dance pieces mostly involve clearly expressed movements. It was only natural that the audience appreciated the spectacular performances from the masters of the age, and General Grant was deeply moved by the plays. In his words of praise, he suggested that Lord Iwakura should pay close attention to preserving and maintaining Noh because such an art could easily degenerate. Lord Iwakura, already a strong supporter of Noh, was encouraged by the suggestion to made further efforts to back the art. The Noh community of the Meiji era subsequently moved forward to days of prosperity, starting with the establishment of an all-school organization, Nōgakusha, followed by the opening of a Noh theatre in Shiba. In light of this, General Grant is counted among the benefactors of the restoration of Noh in the Meiji era.